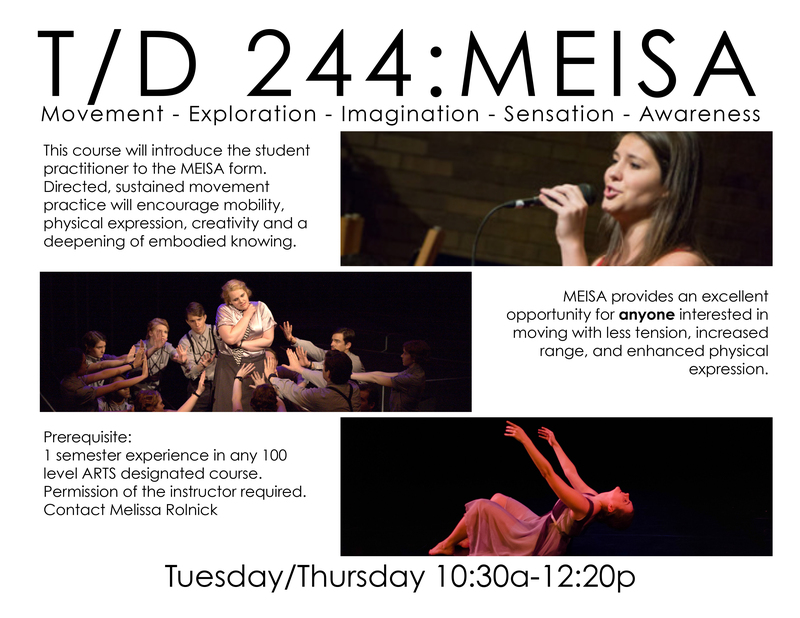 MEISA: Movement – Exploration – Imagination – Sensation – Awareness, is being offered as a Special Topics Class, T/D 244 in the Fall of 2016 on T/TH 10:30-12:20, taught by Melissa Rolnick. It is a developing somatic/contemplative movement practice that invites all participants who are interested in moving with greater ease, expression, and range. No dance training is necessary, only a willingness to explore through movement your potential as an embodied being. 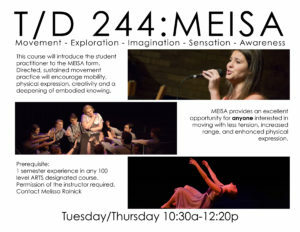 MEISA invites curiosity into the kinesthetic experience. The practice seeks to enliven a practitioner’s inner space and awaken the creative impulse by attending to sensations and engaging imagination. Embodied expression manifests as one follows a kinesthetic thread that arises through sustained exploration. Cultivating an attitude of non-judgment is part of the discipline as movement unfolds, patterns are revealed and subsequently released through attentive investigation over approximately forty-five minutes. Locating oneself within (inner space) and simultaneously locating oneself in outer space is another invitation that MEISA offers. The sensory, movement research is meant to lead one to a place of personal location. Sometimes we can drop into locating ourselves with ease, while at other times some coaxing is needed as perceptions and movement patterns may inhibit exploration. As a teacher/facilitator it is Ms. Rolnick’s charge to guide the students to a place of discovery, and as Hubert Godard stated, “rehabilitate the imagination in areas of fixation”. By committing oneself to a particular time and space a mover is saying ‘yes’ to creative possibilities. Often that is all one needs to let delight in the kinesthetic experience take hold. Imagination and sensation work in conjunction as they feed and inform each other. Sometimes feeling and perceiving can lead to arising images. Conversely, images can lead to enhanced sensation and changes in perception. We would be delighted to have you register for this new class. If you have any questions, please contact Melissa Rolnick at mrolnick@gustavus.edu.